AVID is announcing the arrival of the 2.5mm thick, hard anodized B44.2 chassis. The AVID chassis improves handling, lowers CG, and includes an optional ballast weight system which allows for adjustable weight bias while keeping the CG as low as possible. AVID team drivers have been testing this chassis in Southern California with incredible results. In addition, the B44.2 chassis has a second set of center bulkhead holes to allow for a B44.1 +8 conversion! Extra parts are required and sold in an upgrade pack which includes: AVID B44.1 +8 rear top deck, rear center drive shaft, B44.2 battery trays and straps. Racers will be on their own to upgrade their body shell or to modify their existing 44.1 shell. 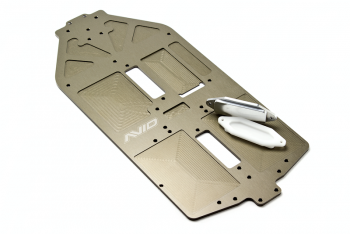 7075 Aluminum chassis plate, CNC machined and pocketed. Hard Anodized and laser etched with AVID logo. Ballast Weight System on chassis centerline allows for adjustable weight bias*. Less chassis flex chassis gives more steering and more predictable handling. Weight increase is 55g over the kit carbon fiber chassis however it lowers CG and removes the need for additional added weight up high on the chassis. Set comes with chassis, 1 Delrin ballast weight, 1 Aluminum ballast weight, 1 Upgrade RC chassis wrap, 1 AVID decal. *additional Delrin (3g), Aluminum (9g), or Steel (21g) inserts sold separately for more tuning options.